Vintage cars, motorcycles, and Italian scooters. 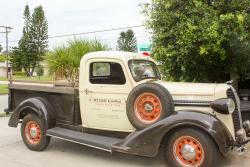 Currently restoring 1937 Dodge Pickup - daily driver. Past vintage cars include Porsche 356, MGB, Jeepster, Metroplitan, Piaggio Vespas, BSA. No, its a low pressure system, plain cap. My 37 pickup has one locking handle on the passanger side. I had to replace the key cylinder, easly done once you remove ir from the inside handle and shaft. So you would neeed ot find at least one outside door handle that matched the look of the existing handle, but you would not be able to lock the door from the inside. Asking 14,900 - for sale or trade. My 28K looks quite high compared to this '38. I will have to do more research on value. Thanks for the link. Ok, Dave nailed it. From what I can tell the frame is 36, probably rolling stock leftover due to poor dales, everything above the frame is 37, thus the title. My research shows the last LC as VIN 8156402 and the fist MC as VIN 8155701. My VIN is 8145810. I am still looking for the frame number. This was not uncommon due to the depression. The Engine has a build number of T38-31300 which I believe is a 218 engine used int the '37 MCs. As to what I want for it, it's open. I have 28k in it just vehicle and parts, of which I have a complete record. I would keep it but for my left hip - so any reasonable offers will be considered. I wanted to keep it as is so I cleaned up the tips and where there was a poor connection I added a coating of sodder to the 3 tips. Not had any trouble since then. I have seen complete wiring harnesses on the net, though. Ok, Dave nailed it. From what I can tell the frame is 36, probably rolling stock leftover due to poor dales, everything above the frame is 37, thus the title. This was not uncommon due to the depression, and I know for a fact that the hubcap clips are not '37 but the dash is. As to what I want for it, it's open. I have 28k in it just vehicle and parts, of which I have a complete record. I would keep it but for my left hip - so any reasonable offers will be considered. 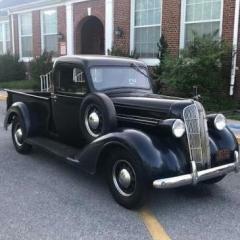 Titled 1937 Dodge Pickup, vin 8145810, for sale. Truck is in running condition and all original. All gauges were professionally repaired and work. All windows, horn, wipers, lights and horn work. Body is in fair condition, this is a work truck and original from the previous owners. I have provenance papers and repair history. I have original voltage regulator and shocks (repairable), and other additional parts. More pictures on request. I can no longer work a clutch so I would consider cash or cash and a running truck with automatic transmission. More pictures and details provided to interested parties, final price TBD. I have a CTH2 Ball & Ball by Carter on my 37 MC. My Dodge 37 1/2 ton has a 36 frame - I have a grease zerk facing down on the support casting between the two pedals. I suggest trying to clean out the open hole facing down, it may be threaded for a zerk or it is broken off. Thank you for responding. OK, in your example is "is there a space between the bottom of the radiator (green) and the frame shell bracket (red)? Your drawing indicates that there is , represented by the space between the yellow line and the radiator (green), which is what I have. Or did I miss the whole point?